The BITX 40’s microphone amp has a flaw that may shorten the lifespan of microphones by overstressing their components. Here’s what I found and how I fixed it so far. The mic bias is supplied by the TX line through 4.9K of resistance. TX is the DC power supply, 12-15V. Most electret microphones have a maximum voltage of 10 V, though I’ve seen a few datasheets with a 9 V limit. The data sheets also say that the mics draw 0.5 mA maximum. No minimum is given. Subtracting that from 12 V gives us 9.55 V, so one might think that everything is great. From the books of Bob Pease I learned the importance of worst case design. 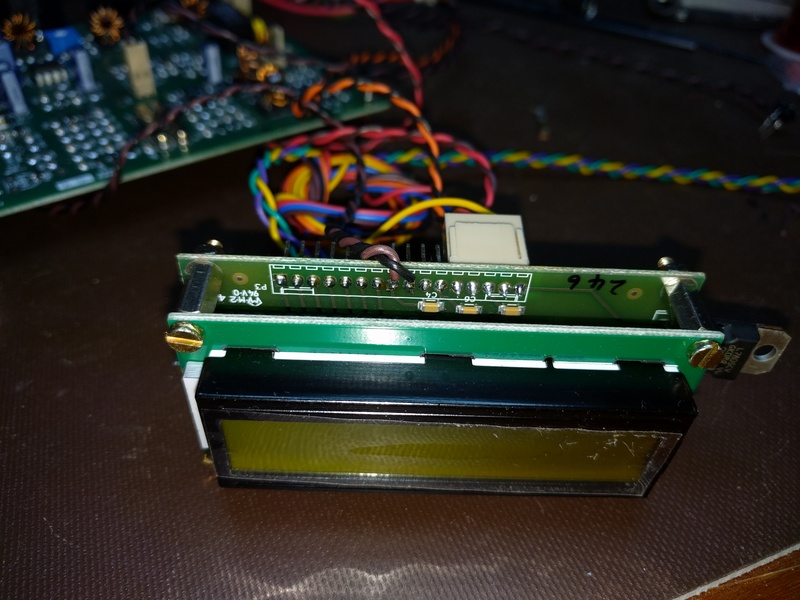 In worst case design, one looks at the datasheet minimum and maximum specifications and designs the circuit to work under the worst combination of specifications. Ignore the datasheet typical ratings, because those describe the best case. No one wants a circuit that only works in the best possible circumstances. 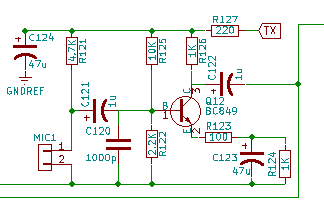 The BITX 40 docs specify a maximum power supply of 15 V, so that is the worst-case TX. The worst case microphone current is the minimum current, but I haven’t seen a mic datasheet that lists a minimum. Therefore, I have to make a guess. I need the guess to be on the safe side without being ridiculous. Knowing that the current is set by a JFET and knowing about both the variability of JFETs and how data sheet maximums are chosen, I could guess that the typical current is maybe half of the maximum and the minimum half of that, so 0.125 mA. If I want to make a truly robust circuit I could assume a minimum current of zero. I know a JFET can’t create current out of nothing, so the lowest possible current it draws is zero. Uh-oh. That’s well above the 10 V maximum for the mic. The zero current case is easier to work out. 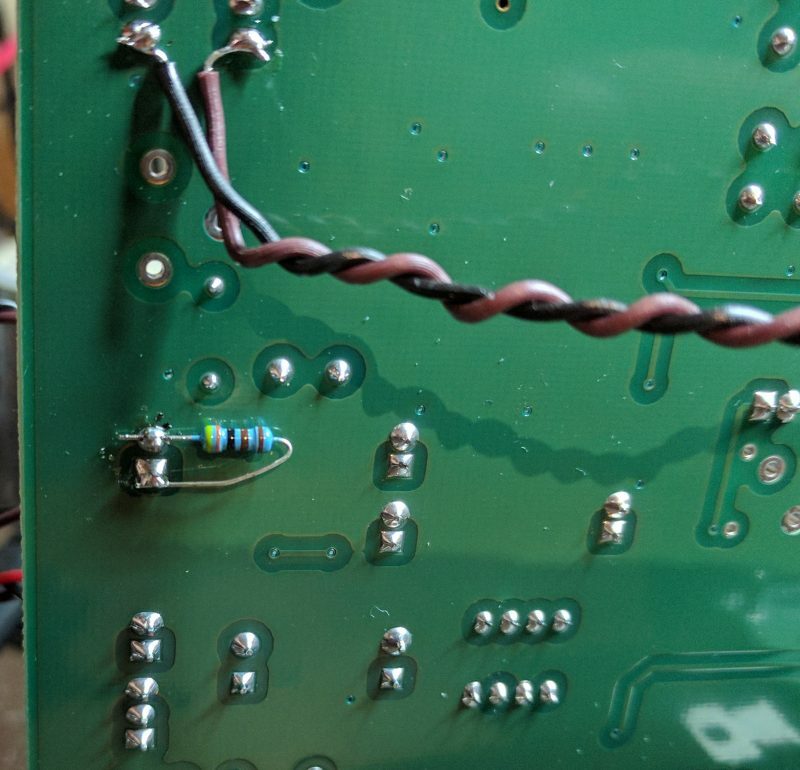 With zero current through the resistor, the mic sees the full 15 V.
A simple fix is to put a resistor in parallel with MIC1, making a voltage divider. I use a computer headset with my BITX, and I know that computer mics are typically fed with 5 V through a 2.2 kΩ resistor. Knowing that, I picked a 4.3 kΩ resistor across MIC1 to form a voltage divider equivalent to 2.3 kΩ fed by 7 V. That’s close enough, and 7 V is well below the maximum for most electret elements. 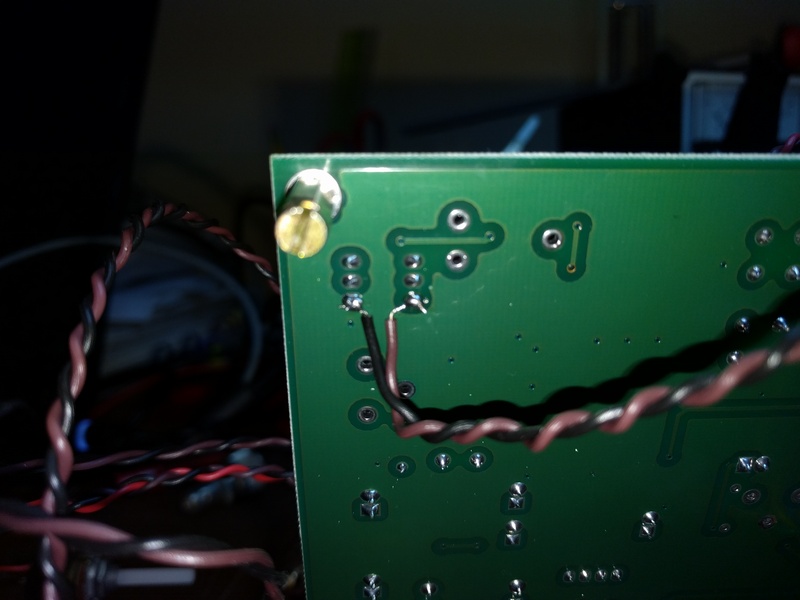 The 4.3 kohm resistor on the underside of the BITX 40 PCB. The wires are for the Si5351 BFO mod I added. Unfortunately, the mic now drives an impedance about 30% lower than before, reducing its output. The RF drive, R136, should be adjusted to compensate. One could fix the issue a different way, of course. A Zener diode in series with R121 could drop the voltage just as effectively without lowering the amplifier’s input impedance. 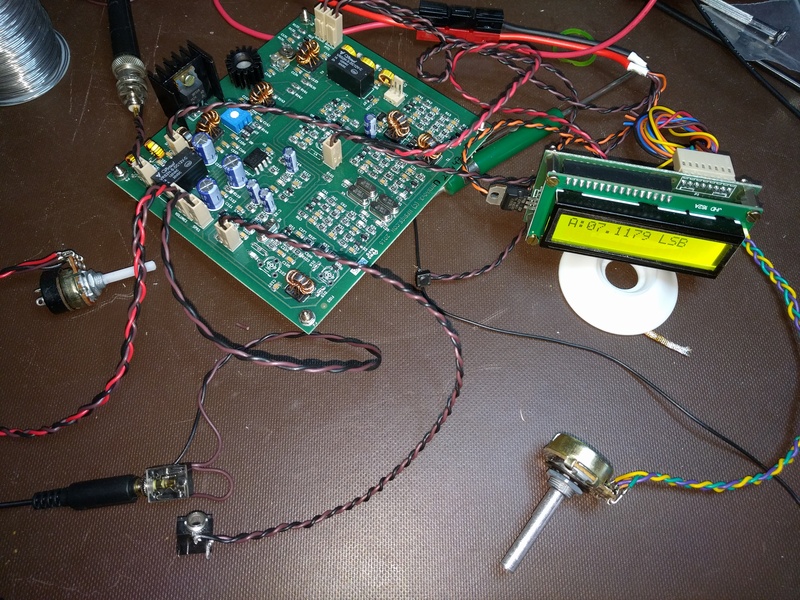 An LM780x regulator could do the job, too, albeit with more components. I happened to have 1% resistors within reach and Zener diodes on a different floor of the house. I chose the resistor. No one else seems to have noticed this issue, so it’s worth asking whether it matters. One answer is that it is worthwhile, and pleasing, to do things right. There is a place for bodging a circuit together that works as a one-off, but I enjoy the n-dimensional puzzle of getting the details right. The other answer is that it might be killing microphones, but not often enough that anyone has noticed. The BITX 20 mailing list, home to BITX 40 discussion, has seen a few comments from hams whose microphone capsules worked for a while, then failed. Some have been able to trace the problems to bad solder joints or physical damage, but I have to wonder if any of the remaining unsolved cases were caused by overvoltage. Manufacturer maximum specifications are based on an assumption about the device’s expected lifetime. Operating beyond that specification can be expected to shorten the device’s lifetime. Sometimes that shortened lifetime is dramatic, with a flash of light, a puff of smoke, or an outpouring of heat. Other times it is subtle and takes longer. Perhaps mic elements will fail faster than usual. Perhaps their average lifespan will be 2 years instead of 20. The difference might not be enough to notice, but we can fix it anyway. Worst case design will save the day.